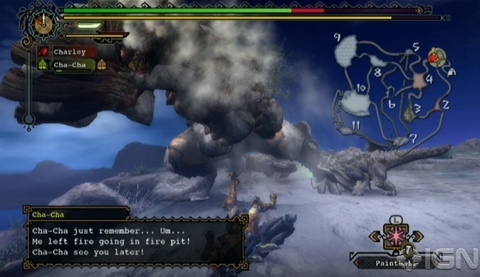 Monster Hunter Tri is a Wii game that came out in 2010, in North America. Although not many people know about the game, it is very much loved in Japan and gaining popularity in other countries. Is this a good game that everyone should play? Absolutely not. It is a great game but it does not appeal to everyone that’s for sure. For those who are not into fighting awesome giant monsters/dragons/dinosaurs, you might want to look for another shooter. For those who love being awesome while swinging super heavy weapons, here are a few reason as to why this Side Quest Boss thinks you should play. The story takes place in the village that said monster is destroying by causing earthquakes. You, being the only hunter around (because let’s face, it’s in the middle of nowhere), are charged with the task of killing the beast. So they just drop you in the sea with a tiny sword and hope you survive. Nah, they tell you that you are not ready but that one day you might be able to defeat such a foul beast, when you grow some muscles. And so begins your training. The tutorial tells you everything you need to know and it gradually drops you onto the main story without you noticing. It is great because it feels natural and it does explain in depth a lot of the things that will be useful in the future. Afterwards you are giving tasks by a local Guild associate who is in charge of you. The Guild is in charge of all Hunters. You will do the quests until you finally are strong enough to fight the Lagiacrus, the monster causing all the trouble. Along the way you will meet a little companion called Cha-Cha that will serve as fodder while you slay the monsters lurking around and forge weapons and armors that look really cool. There is only one village where all the talking takes place and five different areas where the hunting takes place. As you clear quests the areas will become available to you and stronger monster will appear. You can access the area called Desert Island any time you want, even outside of quests, but all the other ones can only be visited during quests. Which is kind of a bummer because sometimes large monsters tend to just show up uninvited. Apart from the main story, there are small side quests that the villagers need doing, they are all about gathering materials and you usually complete them just by doing the missions assigned to you by the Guild. Each character has their own distinctive personality and it brings something extra to the village that you will see over and over again. Even though the story is quite simple, the game mechanics, animations, and other various elements make up for it. At its base it quite simple: you have a weapon, there are monsters, and you have to slay them or capture them. Your first though will be to run towards the monster and defeat it in a spectacle of your prowess with a sword. You will fail. 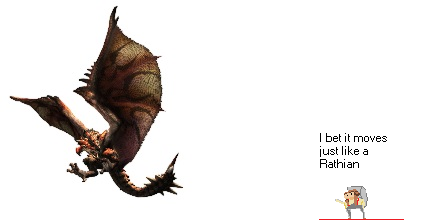 Unlike other games, in Monster Hunter Tri, one must study the monster, learn it patterns, and attack when he is open. This can be sometimes very challenging, especially when it is the first time you encounter the monster because your lack of familiarity with the monster makes it seem as if it never stops attacking. Practice makes perfect in this game as you do not level up and so being extremely powerful because you spend a lot of time grinding will not give you any results. Your own skill and the equipment you carry is what make a battle easy or hard. Aside from learning about the monsters by fighting them, you will also have to learn to use your weapon in the most efficient way. There are several types of weapons: Sword and Shield, Great swords, Long swords, Switch Axes, Lances, Hammers, and Bowguns. Each has their own strength and weaknesses. What’s more, they are all heavy aside from the sword and shield. So don’t expect your character to lift a giant sword and dance around with it like in other games. The animations take time and if you don’t make sure you hit at the right moment you will most likely get hit by the monster. These weapons can be created and upgraded to best suit your playing style. Most hunters have more than one weapon, and they use specific weapons for specific scenarios. To create or upgrade them you will have to gather materials which are often carved from monsters or given to you after certain quests. You will most likely fight a monster a couple of times before getting everything that you need, so learning how to fight them becomes very important if you want to save time. Armors are made the same way, so be ready to fight bosses more than just once in order to advance. Although you will have to fight bosses more than once, it doesn’t get repetitive. Every fight is different and you feel as proud beating a monster for the tenth time as you did the first. Thinking little of the monster can land you in some serious trouble when they surprise you with an odd combination of attacks or just happen to do something differently. Even the best armor won’t protect you from everything and getting hit can mean the difference between “Look I am a total awesome Hunter” and “RUN! RUN AS FAST AS YOU CAN!! IT’S COMING!!! !” Every monster fights with its own style and it is a mistake to think you know how they will behave. You will be surprised and it will hurt. Something that caught my eye from the start was the animations of your character and the monsters. Your character moves in a very life like way but does do cartoon poses now and then to relieve the tension and add some comical effect. Weapons feel heavy and the transition between animations is smooth. Monster on their part have a wide range of animations that feel very natural, and are pleasant to the eye. Each monster also has its own animations making them unique from the pack. If you do finish the story there is always the online servers which have an array of quest that you may enjoy with other players. Players enter a city where there can be up to four players and then embark on quests together. One can always chose to do a quest on their own if they do not agree with the rest of the group and so you are not obliged to do whatever the majority choses. The quest online are very similar to the quests in the village but later on there are some big differences. If you want to access high ranking equipment it can only be done through the online game play. There are also three monsters that can only be fought online. I will not spoil the surprise but I will tell you that they are pretty badass. So if you like having adventures fighting giant monsters, dragons, and dinosaurs type creatures, Monster Hunter Tri is a good game for you. The feeling of overcoming a difficult boss is always great and know that there is always more to keep on pushing you forward. I would recommend this game for anybody. Do I think everyone will fall for it, no, but I do think that those who do will find it a very special game. 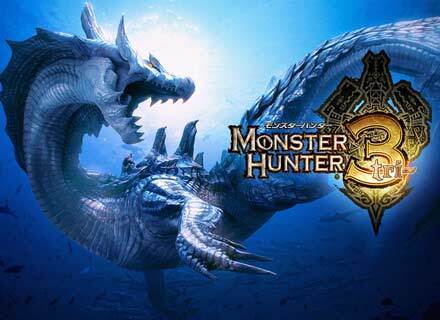 And let’s not forget that there is a new Monster Hunter coming out March of the next year, so happy hunting. This entry was posted in Reviews and tagged action, adventure, boss, bows, hunter, lagiacrus, monster, open-world, spears, sword, tri, village, weapons. Bookmark the permalink.